The build-up to the Beatles appearance on the Ed Sullivan Show on February 9, 1964 had been phenomenal. Already a sensation before they touched down at New York’s JFK Airport two days earlier (where they were welcomed by at least three thousand screaming fans and reporters, all jostling each other for a better look), their performance on America’s most-watched TV program would introduce them to the rest of the country. Ed Sullivan’s first exposure to the Beatles was at London’s Heathrow airport the previous Halloween. Beatlemania was already in full-swing in England, and Ed saw firsthand the pandemonium they caused when they returned home and their fans turned out to greet them. When the Beatles attracted more attention at the Royal Variety Show on November 4 than the Royal Family themselves, Sullivan booked the group for three consecutive Sundays the following February. This was still quite the leap of faith considering the Beatles were still relatively unknown in America, and it was almost unheard of for a British musical act to make it big in the US at this point. But Sullivan’s gamble paid off, as the Fab Four had the number one single when they landed on America’s shores. They cooled their heels at the Plaza Hotel for two days, as legions of fans, mostly teenage girls and some boys sporting Beatle haircuts, gathered outside causing exuberant chaos in the streets of New York. Shortly after 8 pm on February 9, a very lucky 728 people witnessed history being made when Ed Sullivan said, “Ladies and gentlemen…the Beatles!” The group broke into “All My Lovin’”, and all the teenage girls present began to simultaneously scream and/or hyperventilate. 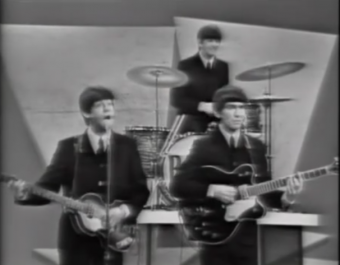 73 million people were watching along at home as the Beatles charmed an entire nation, and by the time they were halfway through “She Loves You”, they were already earning their status as cultural icons for All Time. Over fifty years later, that performance is considered one of the defining moments in music history. It’s one of those slices of time that everyone remembers where they were; everyone has their own memory, their own story. For the generation that had just lost their beloved young president, the Beatles were a welcome break from the funereal atmosphere that had pervaded America since JFK’s assassination. It was comforting to have a joyous common bond as well as a tragic one.